Humility is a rather slippery virtue. It's one of the most important to have, but it's impossible to achieve. Once you set out to become proficient in humility, it has dissolved! If you strive to grow in it by your actions, the moment you check to see how you're doing, you prove your lack of it! So, how does one get around this annoying catch 22 to become humble? Good question. Part of me wants to shrug and assure you I am not your best consultant on the matter. On the other hand, I'm probably as good companion as many along this invisible path to a destination that can only be seen using our peripheral vision - if at all. You know, the blind leading the blind or misery loves company or some such cliche. Humility is difficult to try to become, but it is not difficult to see what it’s like. There are ample great works of spirituality and theology describing humility in detail, as well as the oh, so familiar signs of its absence. 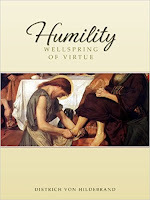 One I recently enjoyed is a tiny little book called Humility: Wellspring of Virtue by Dietrich von Hildebrand. It is actually an excerpt from this great man’s much larger (and therefor, less likely to be read by me), Transformation in Christ. 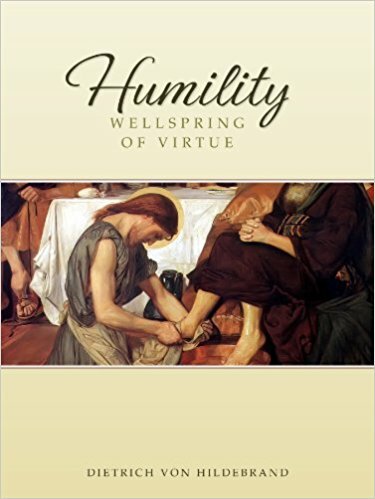 Besides the ease of size, it’s a fun book to read as von Hildebrand excruciatingly etches out the hair-splittingly fine distinctions between the manifold offenses against the virtue of humility. How is this fun? Well, I like that sort of thing (hair splitting), but it’s also kind of fun to think of people I know of who may exemplify these various breaches in virtue. Satanic pride: “Ooo, Lucifer! I know that one!” Literary and historic examples abound, too. It’s fun, that is, until you smack right up against a description that implicates yourself. Ouch. “Similarly, the less we may claim a value as representing a merit on our part – in other words, the less we, as free beings, are responsible for its possession – the more stupid it will be on our part to exhibit conceit on its score; and the more harmless from a moral point of view will be the pride of a value which (as is true of moral values) requires out active participation and effort to be realized, the more reprehensible our pride will be.” (p. 65). So, if you can choose between being proud of your intellect or your red hair, it is more stupid, but less dangerous to your soul to be proud of your red hair. This is handy information! In fact, like perusing St. Teresa of Avila’s mansions, as I read along, wondering if I’m in the second or third room, it slowly dawns on me that I’m pretty much on the door mat, scratching to get in. These and other works might really help us to realize how lacking we are in humility, but we won’t become humble by reading them. It is not a situation where we can “fake it till we make it”. Here's the problem as I see it. We can practice avoiding pride in its many manifestations and will become better for it. We can practice those things that a humble person would do and become better for it. But reducing pride and doing humble things in their place alone does not make one humble, because humility is not simply the absence of pride. Humility is a thing itself. It is a thing that only exists in the absence of pride in all its forms. But it is more than the absence of pride and the presence of certain actions and behaviors. It’s a good start, and by all means start doing the things a humble person would do, but it's not going to become actual humility until you don't even know you're doing it. You could say that about many virtues - you practice until they become a strong habit of doing good without thinking about doing them. With humility, though, it's more than just a habit, like riding a bike or brushing your teeth. Humility requires self-forgetfulness. So, how does one forget oneself?? Sometimes you might be so engrossed in a project that you forget you have an appointment or even to do basic things like eating or going to bed. Has that happened to you? Well, that’s not the kind of self-forgetfulness that leads to humility. The self-forgetfulness that signifies humility can only be brought about by an ongoing, personal encounter with the infinitely good God and bears the fruit of trustful love. A realization of our creatureliness in the face of His omnipotence, but lacking trust, might result in fanaticism (picture here a young Elvis Presley fan, being touched by the superstar and swooning) or in scrupulous fear of receiving Our Lord in the Eucharist. 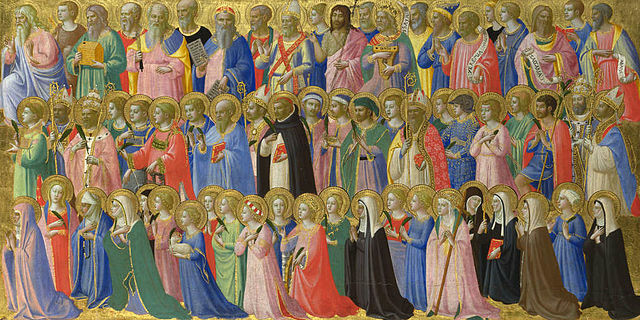 While trust in God without acknowledging our nothingness in juxtaposition to our Creator, could lead to thinking of Him as a dispenser of goodies to us, His deserving children and a complacent reception of the Most Blessed Sacrament as our right. Avoiding either skewed perception – or some other one, is not going to happen just by learning about humility. This right relation to God (and, consequently, ourselves and others) can only be cultivated through a relationship with God. And, a relationship with God requires spending time with Him, opening your heart to receive as well as offer. Rather than reading about humility to become humble, try reading about Our Lord Jesus, spending time in His presence, speaking and listening to Him, meditating on His passion. Let yourself fall in love. Ask Him for those things that will result in the self-forgetfulness that comes from being in Love with the One Whose Love has brought you into being. I know I can’t achieve humility as a trophy to admire in my trophy case of virtues. But I can ask God for humility and hope He will take me as an oblivious trophy in His trophy case of saints. Because, He’s God and can do things as miraculous as that.